On Friday morning, a familiar name announced his desire for reconsideration for the full five year seat expiring this month on the North Hudson Sewerage Authority. Reconsideration, as he's already an existing commissioner in a five year term on the same board. The applicant, Brian Assadourian has served on the board for two years. His term isn't set to expire until February 2018. The application which raises eligibility, ethical and legal issues beyond the big tent of good government adherents created a firestorm in the comments section on Grafix Avenger where anonymous speakers let fly. 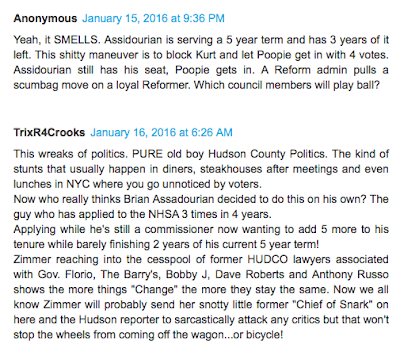 At least one commenter believes several council members may be lining up to hand Frank "Pupie" Raia another of his many five year terms on the board. 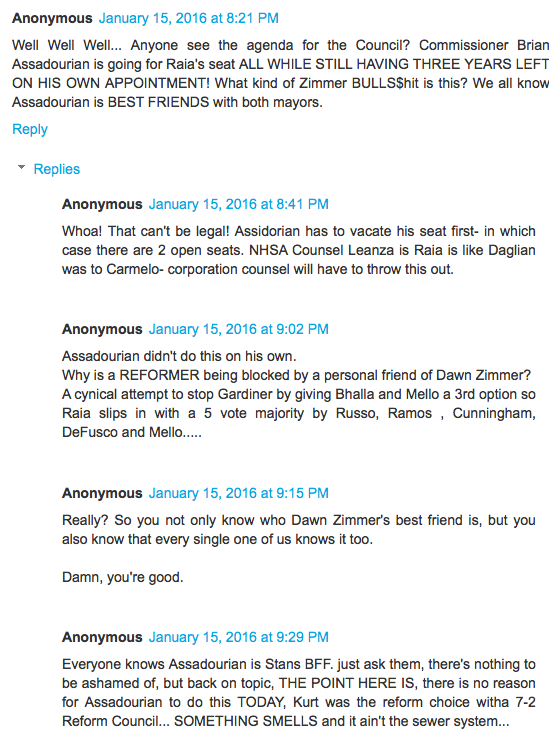 Two of the council members mentioned by the commenter at 9:02 pm last night voted for Frank Raia's last term in 2011: Michael Russo and Dave Mello. Talking Ed Note: Houston, we have a problem. Actually, we have another problem. This is the type of maneuver one would expect from HudCo. Hoboken in recent years has attempted to move away from those clutches. More importantly, that type of behavior is frowned upon. Or was.